In a post earlier this week, I mentioned a Bill James quote: “If you could split [Henderson] in two, you’d have two Hall of Famers.” James was totally serious. Since James wrote those words, Wins Above Replacement (WAR) has become the Nerdosphere’s favorite total value stat. Does it support James’ contention? Let’s “split Rickey in two” and found out. Average Hall of Famers are worth around 60 WAR for their career. Henderson’s career total is about 114 WAR. Dividing that by two gives you 57 WAR per “player.” That’s just about right for the Hall. However, as we’ve discussed before with regard to players like Johnny Damon (here) and Omar Vizquel (here), it isn’t all about totals: we want a player with an impressive group of peak seasons. What is a good baseline for a Hall of Fame career? We should not simply say “well, player x is in, so anyone with a better career than player x should be in.” If Jim Rice is the baseline, it’s going to water down the Hall too much for most of us. That was a nice bonus to Andre Dawson getting in: although he wasn’t universally thought to be a Hall of Famer, he wasn’t a travesty. He had longevity, but also had a nice peak. He’s not shame to the Hall. So he’s our Actually Existing Baseline Hall of Famer. We can get good picture of his career by looking at a handy “nth Best Season” WAR Graph. Um, yeah. That 1985 MVP that Royals fans think Don Mattingly stole from George Brett? He actually stole it from Rickey. And Henderson’s 1990 in Oakland might have been even better. The total WARs of Rickey 1 and Rickey 2 aren’t quite as high as Dawson’s but a few wins are no big deal. 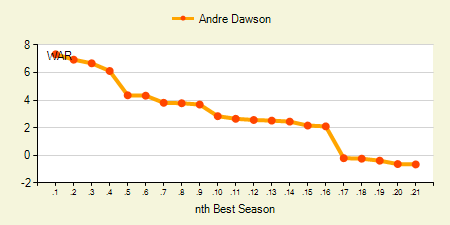 Neither had Dawson’s longevity either, but careers over ten seasons are good. But the peaks… oh those peaks. 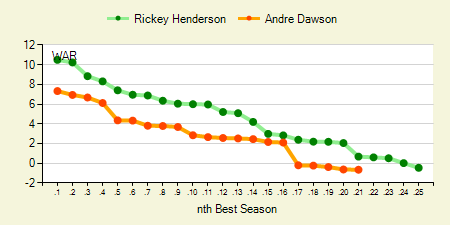 Both Rickeys have two seasons better than Dawson’s best season, and their third-best seasons are right there. The overall accumulation is borderline for the Hall, but those incredible peak seasons push the careers over the top. I think Dawson is a rightful Hall of Famer, and if he is, both Rickeys are, too. We hoped you liked reading Splitting Rickey Henderson in Two by Matt Klaassen! You get three very skinny people with normal-sized heads. The amazing thing about Bonds is that if you separate his career into 3 consecutive 7-season chunks, he has 50.2, 57.2, 64.4 respectively. As in, you don’t have to take all of the seasons from one “prime” period of his career, like you have to do with Rickey. Rickey was amazing for the first 15 (!!) seasons of his career. His “longevity” though came from 11 seasons of ~20 total WAR. He had longevity and he had greatness, but they are separate points. Okay, but there’s a “reason” why his aging years trumped his prime years. He had longevity and he had greatness, but they are separate points. 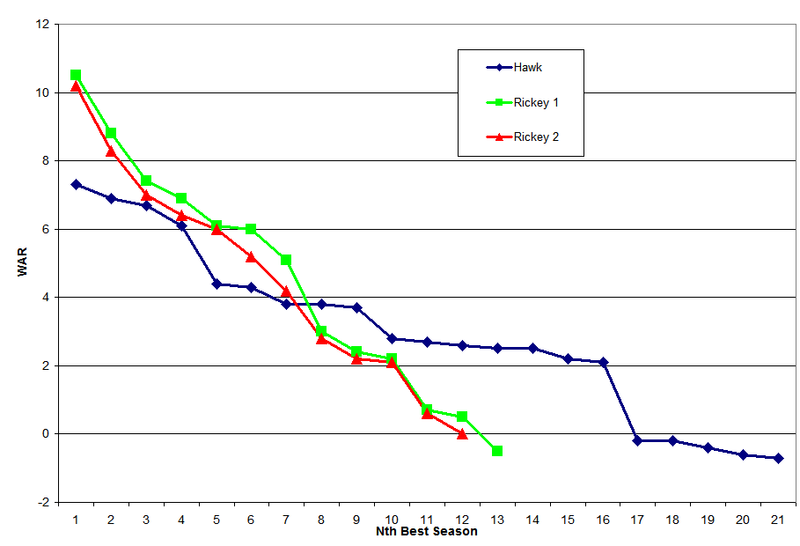 Gee, I wonder what the difference between Bonds sustained dominace and Rickey’s reduced performance in longevity was? It must have been genetics … or training … or desire. Seriously, i can’t believe a statement would be made like that. Bonds and Greatness and BALCO. This site really needs to stop ostriching the issue when talking about it. Especially when the comment is made to elevate Bonds performance as compared to Rickey’s. If anything, you may, without intent, illustrating the effects of PEDs on the aging curve. It would be very difficult to pick players that had better genetics, talent, or skill, than Rickey Henderson. That Bonds put up 40+ more WAR in his aging season is revealing. I suppose I should say thanks. Aging curves change with medical and chemical advancements. Players in the early 1900s aged way worse because conditioning was worse. Rickey had the benefits of improved supplements, improved knowledge, and improved conditioning techniques and availability. If Rickey lived in the 1910s, he would not have lasted 25 years. But we don’t hold that against him. You can’t pick and choose the inequalities that you think are OK. I thought we were discussing two guys whose careers had overlapping seasons? I didn’t realize I was comparing Rickey to Wagner and Anson. What I’m specifically saying is that you can’t ding Rickey for having longevity at the expense of sustained greatness while referring to Bonds having both longevity and sustained greatness. Bonds (unknowingly) used PEDs in the 2nd half of his career. To compare the performance in aging years is absurd. Why is it that every time Bonds is mentioned, the entire conversation then shifts to steroids? It’s quite annoying. Yes, we all know he took steroids. But that doesn’t mean every conversation about his stats needs to be interrupted. It’s not like every time someone mentions Ty Cobb’s batting average, that every subsequent comment is a complaint about how he was a racist dickhead. Yes, we can. Some are ethical, and some are not. Rickey having better training & nutrition regimens than early players falls in the first category. Bonds almost certainly broke the law as well as obtained an advantage unavailable to not only earlier generations of ballplayers, but his honest contemporaries. So being bored at work I did it slightly differently. I gave 2 seasons to each “Barry” from the Pirates in descending order, and 5 seasons to each “Barry” for his 15 years in San Francisco (with 1 additional Pirates year going to Barry #1). It came out to be 54.1, 59.2, 54.7. Compare that to Willie Stargell’s best 8 seasons and he’s a 48.7. So if each imaginary Barry (poet) had another 4-5 years of simply existing on a baseball field, you got yourself 3 hall of famers. Not to belabor the point, but I’m pretty sure Ty Cobb’s racist attitude didn’t extend his career or improve his statistics. The things Bonds and Cobb did are totally, unequivocally unrelated. And this is coming from someone who thinks Bonds should be in the hall. Why is it that whenever Barry Bonds is mentioned, someone starts ranting about steroids and how that issue is “ignored”. What if people who admire his stats don’t ignore the steroids issue? What if they simply don’t care? What if they realize that there was no testing against them, and no punishment for using them, and they just don’t care if someone did steroids during that time period? Amazing stat. Thanks for the research. In this case I only mentioned Bonds steroid use because a player he was being compared to was derided because of his subar performance in his “longevity” years. The player being derided was among the most talented and skilled players in history, so I felt that one should point out a glaring aspect of the “aging process”. It is very possible that Bonds would have aged very well, I mean he’s gotta be in the top 10 of talent and skill in history. But rather than aging well, he got significantly better. IMO, Bonds was a HOF’er before his BALCO days. My intent wasn’t to go on a steroids rant, but to oppose the comment about Rickey being a below average player during his “longevity” years (as compared to Bonds). @CircleChange11: that you would read this article or even that one line as “deriding” Henderson is simply stunning. Matt … you’re right … deriding wasn’t the right word. I couldn’t think of the exact word that I was looking for. 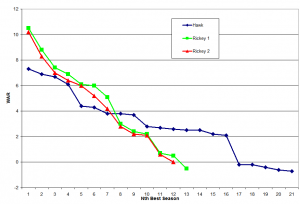 I disagreed with comparing Bonds longevity with sustained greatness to Rickey’s longevity while performing significantly less, specifically due to the PED use. Again, I couldn’t think of the word that I wasn’t to use. “Derided” was far too strong of a word.